Through our relationship with The Sudden Money Institute we are able to provide you with our What If workbook. We find the question what if is the most powerful one we know. What if can open your eyes to possibilities that you might not have seen before. What is your bliss? What would you do in a perfect world that would bring you a great deal of pleasure? Tell your new story. What is that you would like your story to look and sound like? Finding out what you could if you could do anything, but not everything. Having a clear picture of what your perfect scenario would sound like. Being clear about the things that concern you….the other side of bliss. These items will help you become clear on what’s important in your life. For people going through life transitions we feel this process increases the odds of your success. 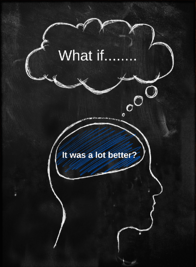 To get our What If Workbook, fill out the form on the right now.